In every Mother’s heart there is a special place for the love of her daughter. Award-winning designer Marjorie Andes captures this precious bond between a mother and daughter in a beautiful stylized heart pendant. 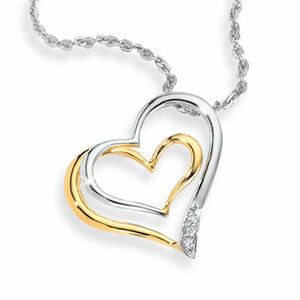 One heart continues to the next accented with Diamonds and 24K Gold signifying that special unbreakable relationship between a mother and daughter. A matching 18” chain is included. The perfect expression of love to be cherished always.